I love teaching as much as I love making. It is such a great pleasure to share my joy in creating and love of different media with others in a variety of ways. I utilize a wide range of venues and formats to present everything from one night creative nights out with wine and cheese to in depth workshops and even internationally renowned conferences. In everything I teach, I strive to inspire and ignite the creative spark within each individual, as well as imparting tried and true techniques for achieving their creative vision. I teach anywhere and everywhere, from individual's homes to major conferences and art centers. If you have an interest in any of the classes, workshops, or events I offer, feel free to contact me at lisel33@sbcglobal.net. Precious Metal Clay, also known as PMC, Art Clay Silver, Metal Clay, etc., is made up of particles of precious metal held together with water and an organic binder. After a metal clay object has been fired with a torch or in a kiln, the water is eliminated and the binder is burned away. What is left is the pure, precious metal. Originally produced in gold and silver forms, it is now available in copper, bronze and stainless steel. Metal clay allows you extraordinary creativity because it can be formed into nearly any shape you desire. It can be molded, shaped by hand, cut, extruded via syringe, painted onto a form, and more. It can be embedded with certain natural and synthetic gemstones and glass that can be fired in place. Additionally, settings can be created for gems and other stones that cannot withstand the heat needed to fire the metal clay and need to be set after firing. No matter what your level of expertise and confidence, you will be amazed at what you can create with this exciting and wonderful medium. The Art Nouveau movement is noted for its appreciation of nature and fluid and flowing lines, making it a natural style for Metal Clay. During this workshop, Lis-el will teach you a variety of techniques for combining stones and glass with coils of metal clay to create elegant forms in this wonderful style. We will discuss the art nouveau aesthetic and go over many examples of finished designs. You will then be shown how to create a strong bezel for a large faceted gemstone, and then how to create elegant tapered coils to combine with the bezel set stone to complete your design. Proper joining of elements for a strong finished piece will be covered as well as how to refine your designs using brush and water. The finished focal can be combined with chain to create a beautiful necklace. Metal clay is an exciting medium that is perfect for creating romantic, delicate and organic designs. During this workshop, you will learn the best ways to create bezels for fireable faceted stones. You will then create your own unique, romantic design using tendrils, coils, balls, leaves and other embellishments, all created from the metal clay. 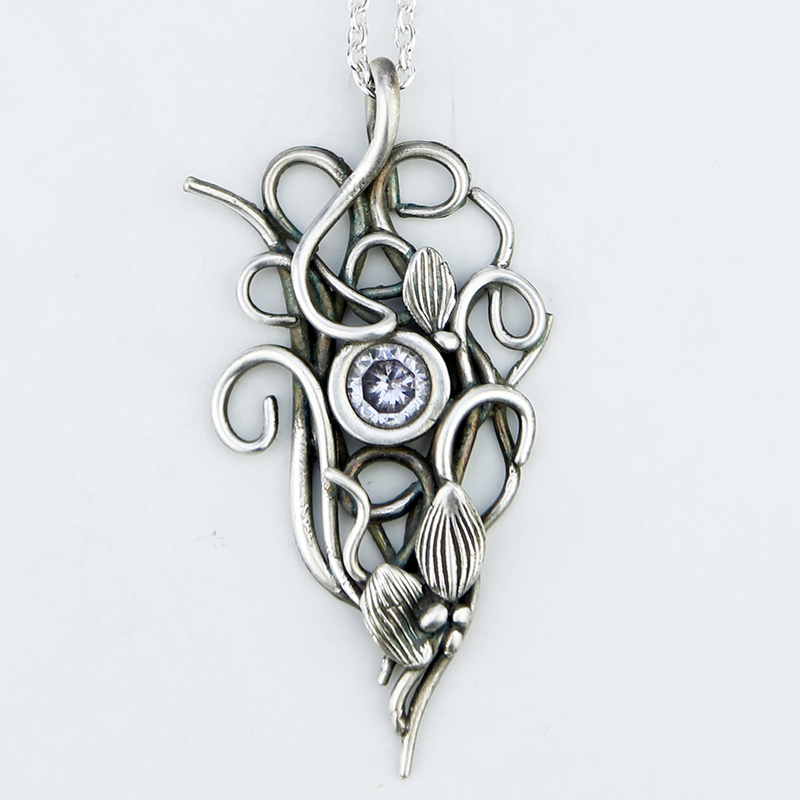 You will be shown how to join these diverse elements to create a beautiful finished piece. Pieces will be fired and finished as part of the workshop. Glass comes in a variety of colors, shapes and textures. It is a wonderful media to mix with metal clay because it can be fired in place. This means you can create your design in one step, without having to solder bezels or set stones after firing. There are also many other options for firing stones in place, including cubic zirconias and some natural gemstones including labradorite and moonstone. This particular workshop can be taught in a variety of formats. During this workshop, you will be shown a variety of techniques for setting fireable stones and glass into metal clay. I will have many options for you to choose from to create your own designs, and you are also welcome to bring your own. In this format, we will begin with a basic fused glass class. I will provide an extensive palette of clear, colored and dichroic glass for you to choose from to create your own unique glass cabochons. While the glass is firing, I will demonstrate utilizing vintage and or colored glass in various ways with metal clay. Once the cabochons are fired and cooled, I will then show you a variety of ways to set them into metal clay, including cab surrounds, embrace settings, and a more traditional, bezel type of setting. The more days we schedule for this workshop, the more techniques I can share with you, including setting faceted czs and natural stone cabochons. During this workshop you will be shown how to create a variety of hollow forms and beads including lentils and tube beads. Basic skills learned during this class will include drying and forming clay over molds, bonding pieces together to create hollow forms, forming clay over other media, and creating seamless forms. Previous experience with metal clay is helpful but not required for this one day workshop. In order to become a certified instructor, you must successfully complete the Level One Certification course. This course is designed to provide an in-depth knowledge of Art Clay. The curriculum consists of seven different projects and covers a wide variety of techniques. Some of the techniques include use of organic forms, creating flat and round-shank rings, addition and firing of gemstones, creating a mirror finish, and much more. This course provides general and technical information, as well as some helpful teaching guidelines. I limit the class size to four students to ensure I can give everyone ample one-on-one attention. I will provide all the tools and equipment necessary for the projects. The registration fee includes the use of tools, equipment as well as a kit of consumable materials such as Art Clay Silver. The fee also includes an instruction book that will be yours to keep.